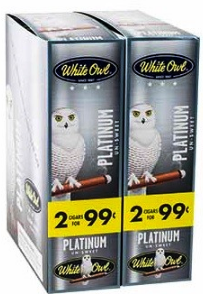 White Owl Platnum 2 for 99¢ Cigarillos Cigars are the perfect low-priced, premium tobacco cigar. Made with a blend of five tobaccos in a light wrapper, these mild bodied White Owl Platnum 2 for 99¢ Cigarillos cigars are sweet in flavor and aroma. Two cigars are sealed in foil pouches for maximum freshness to make smoking them a convenience anywhere or anytime. Come packaged in 30 packs of 2, in foil fresh pouches for guaranteed freshness.